The idea that the world spends too much on war and militarism is widely shared among peace activists. And when they care to think about it, millions of ordinary people around the world share this opinion. But it has yet to become a major political debating point. We aim to change all that! The issue is especially crucial in a period in which tensions between major states (Japan v. China…) and between governments and violent fundamentalists (US v ISIS…), are becoming increasingly militarised. Pressure to spend more taxpayers’ money on warfare is growing. The current situation is also the result of decades of past investments in the military, and the insatiable appetites of war profiteers. 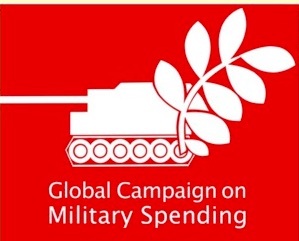 In December 2014, the International Peace Bureau (IPB) announced the launch of a permanent, global, year- round campaign to tackle the worldwide issue of excessive military spending. In 2013 the world’s governments spent over USD 1700 billion on the military sector. This is money that could instead be spent on creating jobs for young people, feeding the hungry, protecting us all from the effects of climate change, tackling ebola…and much more. IPB has for several years called for annual reallocations of (minimum) 10% from the military budgets of all states; and for a process to be started to reduce arms production as well as the international weapons trade. The campaign builds on over a decade of work done by IPB and others on the theme of ‘Disarmament for Sustainable Development’. It incorporates the Global Day of Action on Military Spending (GDAMS) – now in its 5th year), whose goals it shares and which is also coordinated by the IPB. Social justice/welfare: public services, human rights, gender equality, green job-creation. We view the above shifts as part of a wider global transformation towards a culture of peace. * Development: to ensure the inclusion of language relating to military spending and disarmament in the UN’s Post 2015 Development Agenda; to be adopted at the UNGA in the autumn. * Climate: to ensure that the target of $100 bn in annual governmental contributions to the Green Climate Fund is met by the date of the COP 21 climate conference in December. These contributions should come from reductions in military budgets. . . .
All are welcome to join! Just drop us a line at: mailbox@ipb.org. I think it was Marx who said that military spending is like throwing money into the sea, since it does not produce anything of value for people. We could saw this previously in the case of the Soviet Union that was driven into bankruptcy by the arms race, which was a deliberate and successful strategy of NATO. But now, if we look clearly, we can see it is now the case for the United States which produces very little for export and imports enormously (especially from China), while it spends most of its wealth on arms production. Arms production is hidden in the official government budget of the United States. First, the government adds in social security which does not come from taxes, but which is simply a form of saving by those who pay into the system. Then it hides much of military spending in other budgets (for example nuclear production is hidden under energy). And finally, it fails to mention that most of the enormous budget item of debt payment is actually the payment for previous wars and arms production. According to the careful research of the War Resisters League, almost half of the federal budget of the United States is for present and past military expenses. This amounts to over 1.3 trillion dollars a year!